Her question stuck with me, so I began to search the Internet for images and articles about the teaching 10 more or 10 less. Well, much to my surprise I did not find much on teaching this skill using a concrete model. The concrete models that I found used base ten blocks to model the skill. It’s no secret that I am not a big fan of base ten blocks. 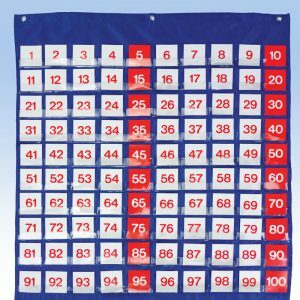 I prefer number disks because struggling students can relate to number disks better than with base ten block and number disks can be used to create a more solid foundation for other skills such as money, addition and subtraction with larger numbers, and decimals. When I think about teaching 10 more or 10 less to 1st graders I had to wonder why am I teaching this this? I’m sure that this is a question that many 1st grade teachers ask. 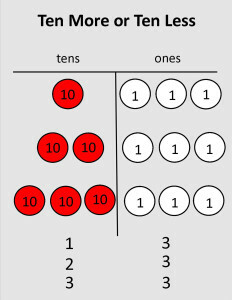 The answer to this question is 10 more and 10 less is important for students to learn because it requires the learner to focus on the 10’s place.This focus is important because in 3rd grade students begin to round numbers to the nearest 10. If you have taught upper elementary many students do not master rounding because they don’t understand the place value aspect of rounding. The goals of the Common Core Standards is for students to have a better conceptual understanding and greater coherence of math concepts. If you look at the model the 10 more or less skill is a perfect example. 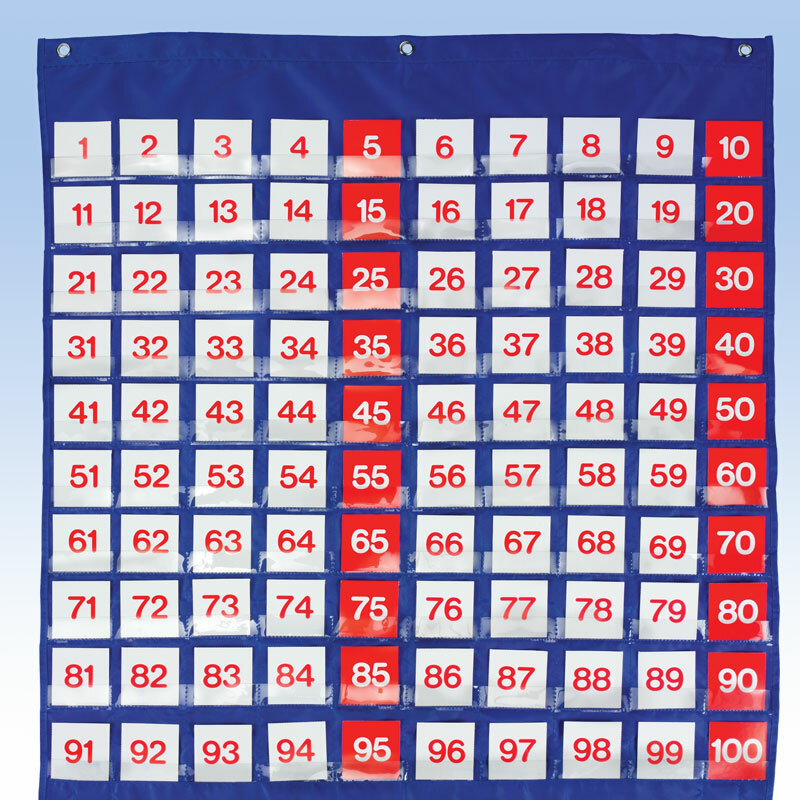 This skill challenges the students’ understanding of on one to one correspondence, more or less, and place value. A concrete model of this skill will also require students and teachers to use mathematical practice 7, look for and identify patterns in a structure. 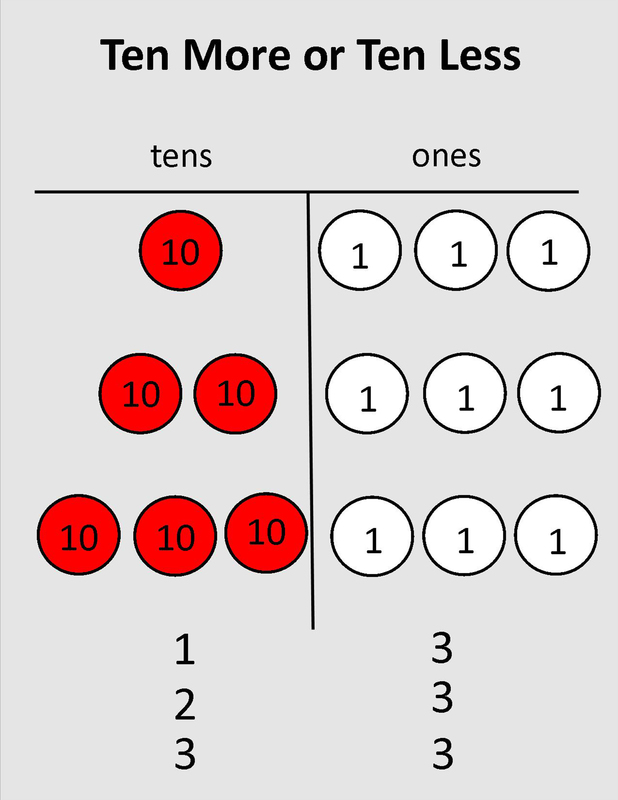 The pattern in the model is the tens place will always have one more ten than the number in front a specific number and one less 10 than the number behind a specific number. If my Internet search is any indication of how this skill is being taught then many students are not reaping the full benefit of the new standards, because the conceptual understanding is still lacking. When a teacher begins teaching from concrete to abstract (especially in elementary) then it will open the door for students to be able make sense of math concepts and construct viable arguments and critique the reasoning of others. Prominent researchers, Rita and Kenneth Dunn said, “Children enter kindergarten as kinesthetic and tactual learners, moving and touching everything as they learn. By second or third grade, some students have become visual learners. During the late elementary years some students, primarily females, become auditory learners. Yet, many adults, especially males, maintain kinesthetic and tactual strengths throughout their lives. Numbers are an abstract concept for students in grades K-2 and teaching these skills from concrete to abstract will determine if a student will become apart of the bigger picture. If you would like to use the model and number disks, you can download them for free in my store.